The “Seven pillars of (BIM) wisdom” | BSRIA Blog - Opinions and insights from BSRIA Limited. 2. PAS 1192-3:2014 takes the processes described in earlier 1192 publications and develops them for use in the operational life of assets. In turn, this leads to the use of new concepts such as organizational information requirements (OIR) – the information which organisation needs to know in order to run the business, the asset information requirements (AIR) – the information the organisation needs about the asset it is responsible for, and the asset information model (AIM) – the information or data set which describes the asset. This is an important document for the FM industry as it sets out the need for comprehensive and accurate information, the AIM, which can be used as the basis for all asset-related decision-making. However, it also requires that the AIM is kept up-to-date to accurately reflect the status of the asset. 3. BS 1192-4 will define expectations for the exchange of information throughout the life-cycle of an asset, and will include requirements for reviewing and checking for compliance, continuity and completeness. COBie is the UK Government’s chosen information exchange schema for federated BIM Level 2, alongside graphical BIM models and PDF documents. 4. 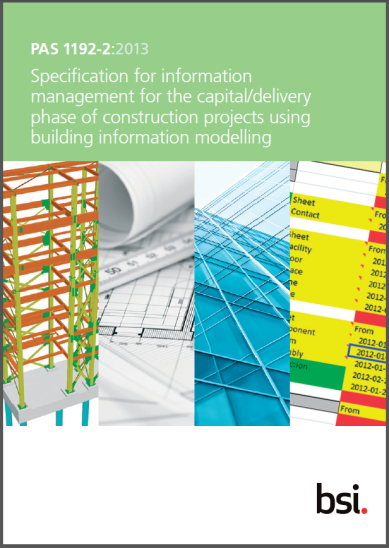 The BIM Protocol was published by the CIC in February 2013 and identifies building information models that are required to be produced by the project team and puts in place specific obligations, liabilities and associated limitations on the use of those models. The protocol can also be used by clients to require the adoption of particular ways of working – such as the adoption of a common naming standard. 5. Soft Landings is a form of graduated handover for new and refurbished buildings, where the project team is contracted to watch over the building, support the occupant and to fine-tune the building’s systems, for up to three years post-completion. The link with a Soft Landings process – or GSL in the case of the Government – may initially seem a tenuous one, but the data gathered during the operational phase of an asset can be very important in helping to shape project needs through effective EIRS. it is vital that the way the asset is used and maintained is considered during the briefing and design process – ‘start at the end to inform the start’ is a phrase that gets spoken a lot in construction these days and is a very apt one in this context. A Digital Plan of Work (dPoW). The dPoW should define the deliverables required at each stage of the design, construction, maintenance and operation of built assets. The dPoW should be made available digitally to enable simple access to all stakeholders to make use of the system to give clear definition as to what geometry, data and other information should be delivered at each of the eight stages of a project (APM 0-7). A Classification system. A standardised classification system should be developed to ensure that data is able to be indexed and structured to make it easily accessible in a common format. The classification system should be digitally-enabled, so that it integrates with the Digital Plan of Work. This should include digital capabilities including extensive search and analytics to assist classification and to identify Digital Plan of Work activities and deliverables as well as more traditional functions such as taking off, costing and benchmarking. The refining of the UK Government’s BIM Level 2 requirement by use of these seven components is an important step forward. This gives the clarity the industry has been asking for and, once the final two components are available, will enable it to develop a robust and effective response. March 2015 is going to be a very interesting time.